During the 60's George recorded many of Jamaica's Ska groups including the Skatalites with Don Drommond on trombone., recordings at this time were limited to Two and Four tracts. 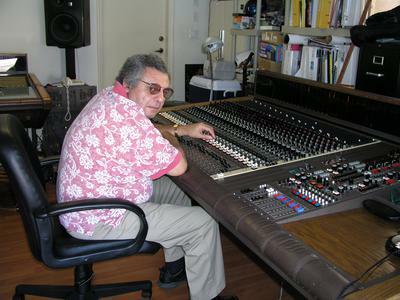 George became skilled at using proper miking techniques frequency and Acoustics producing producing several recordings which became hits. Bob Marley and the Wailers with Bob Peter and Bunny first recordings were made during. The Ska era and George was there and contributed to countless Ska Hits. Recording studios evolved with the music. Style changing from Ska to Rock Steady. To. Reggae. multi Track recording was now commonplace during the 70s and 80s. The Paragons , the Diamonds Alton Ellis Burning Spear, Dennis Brown, Jimmy Cliff ,Toots Ernie Smith and Pluto Shervington Lorna Bennett And Many more top Jamaican Artists. The Studios and Jamaica had. Now become popular with international Artists. Who performed. And. Recorded many hits at the major. Recording studios in Kingston. And many more recorded with the assistance of Geoage Raymond as. Sound. engineer.. In USA Europe and. many countries. On the comprehensive use of past and Present studio and. Recording. Equipment. The enclosed. Picture was. Taken with George at a. MCI 536 . Bob Marley chose a MCI 536 for His first studio on Hope road. In Kingston.Jamaica and recorded at Compass Point studio with a MCI 536. The board, shown is a MCI 536 is being refurbished in Miami Florida by Karl Grant (kag2020@aol.com). George has engineering knowledge gained from Kings College in London and Experience gained over the years.and now appreciates the flexibility offered by the current products of the Digital Domain.